Today I’m off to Dublin! It’s been years (I’m talking high school), since I’ve been back to Ireland, and I’m so looking forward to catching up with it. I’ve heard amazing things about the Cliffs of Moher, so I’ve signed up for an ambitious 12-hour long tour tomorrow to drive over to the western coast of the country. The weather is supposed to be very chilly tomorrow, but luckily it will be sunny – hoping to snap tons of amazing pictures of the countryside and coast! Today and Thursday are going to be spent wandering around Dublin, taking it all in. If you have any musts I should check out before I leave Thursday night, send me an email or comment below! Because it’s so chilly, I went on a little shopping trip yesterday to Zara to pick up a couple new coats. I wasn’t wanting to spend a lot, but knew I needed something a little heavier for this trip. It just so happens that Zara’s completely stocked with incredible outerwear right now! The pieces I picked up include this fitted puffer coat, this faux shearling jacket and this plaid cape coat. I now feel like I have something for every occasion this fall/winter! I think I should be set. Best of all, it didn’t set me back all that much – three gorgeous coats for under $650? Yes, please! Love it all!I’ve been getting a couple of outerwear pieces from Zara too, they do it so well, and the best part is not breaking the bank. Have fun in Dublin! So many gorgeous pieces. I’m loving that shell! Gorgeous! All of it! I love love love black. Lovely over-the-knee boots! I’ve actually been looking for a new pair ever since I got rid of last season’s pair. Love this scarf, and ya know, everything else too! 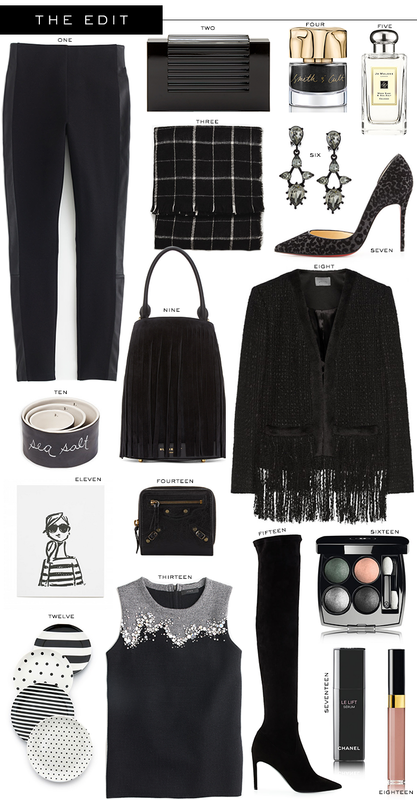 Great picks, you can’t go wrong with black and white. Love this monochromatic palette! That fringe is just so good.